ARBOR DAY IN TREE CITY U.S.A.: With trees blooming all over Princeton, Township Mayor Phyllis Marchand proclaimed April 29, Arbor Day, last Friday at Johnson Park School. 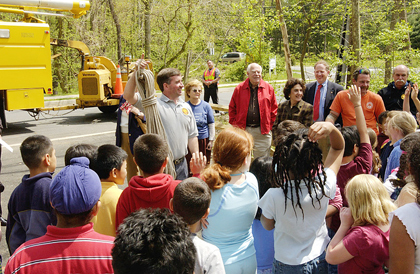 Pictured here, Township Arborist, Greg O'Neal, is asking some Johnson Park third-graders to guess how much weight the rope he's holding will support. The answer was 6,000 pounds. Nobody guessed right. Princeton Public Library Director Leslie Burger has been elected the president of the American Library Association (ALA) for the 2006-2007 term. Princeton smokers looking forward to lighting up in the soon-to-be opened public plaza will have to light up elsewhere as Borough Council last week approved a measure that will ban all smoking from the 15,000-square-foot area next to the Princeton Public Library on Witherspoon Street. The ordinance reflects statewide initiatives whose aim is to rid public places of second hand smoke. Members of Borough Council and Township Committee met last week to approve joint spending for the two municipalities' 15 shared services and agencies.